With so many watermelons all over the place come ripe season, it’s no wonder that you’d want to make a watermelon moonshine. 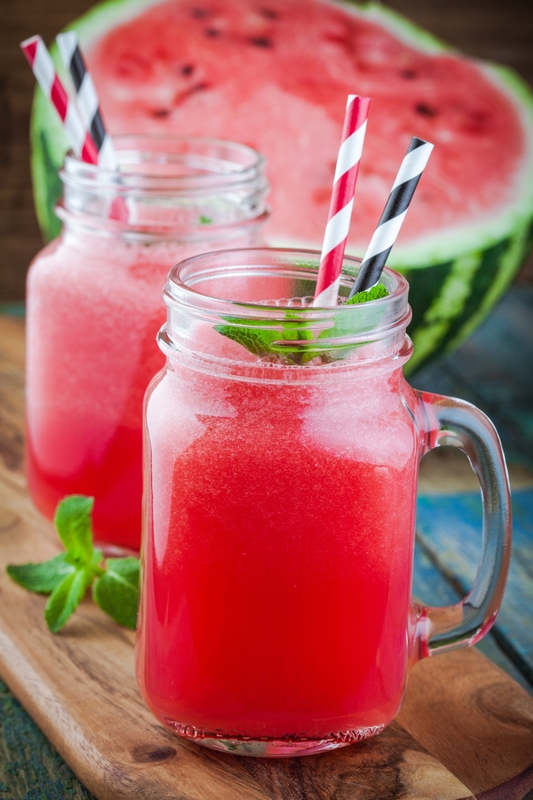 The good news is that watermelon is full of simple sugars that can be used for fermentation. The not so good news is that you’ll have to work a bit to get those sweet sugars into your mash. We’ve also added some peaches into the recipe for added complexity and flavor. And the result is so good that you can actually strain and enjoy the fermented wine straight. But hey, if you’ve got a still of your own, shine on! A fun recipe perfect for those summertime get-togethers! Extract juice form watermelon and peaches making sure to save pulp. In five quarts of water, boil pulp for half an hour. Strain and add water to juice. Let cool to lukewarm and add water until you have five gallons total. Add in all ingredients to primary fermentation vessel omitting only the yeast. Cover with cloth and let sit. After one day add yeast. Let sit for one week making sure to stir daily. Next fit fermentation trap and let sit for four more weeks before bottling. Cut the peaches and the watermelon into cubes and run them through the blender. Put the resulted blend into the cheesecloth to strain the juice from the pulp. Apply pressure to maximize output. Strain the resulting juice into the boiling pot, add raisins and bring the liquid to 160°F for quick pasteurization. Mix in sugar until fully dissolved. Add water to get 5 gallons of liquid in total then let it cool to room temperature. Close the bucket and attach the airlock, ensuring an airtight seal. Let it ferment fully until all activity in the airlock stops, then wait for at least 3-4 days more. Open the fermenter and use the siphon tube to transfer the wash off the yeast and other sediment into your still's boiler. Distill the mash as normal. We’d recommend making some more peach and watermelon juice to mix with the spirit for the final drink. Freeze & Blend the fruits for a great moonshine smoothie! It is very important to discard the first 5oz or so (the foreshots) of the collected runnings as these usually contain methyl and other harmful fusel oils. Make sure to collect the liquid into glass vessels, do not use plastic, as the spirit coming out of the still is hot. It's recommended to use smaller vessels in order to observe the exact distinction between different fractions (cuts) of the moonshine. If needed, taste the spirit by mixing a small amount with an equal amount of cold drinking water.